As always, fall fishing requires adaptability. We can still see some great fishing on bluebird days, but you might need to change your approach. Fall run fish on the Madison in the park will be active, but mainly in the early morning and evening hours when light conditions are low. Dry fly fishing can be great in the sun too, but hatches are generally sparse on bright days. On scuzzy days you can find every slick around $3 Bridge teaming with trout rising to a blanket emergence of Baetis mayflies. On bright days expect one or two of the best fish in each slick rising lazily to random Baetis and Midge adults. There’s still some great dry fly game to be had in the sun this time of year, but you might have to be a bit more patient and look a little closer to find it. The countdown is on, two weeks to go. It’s time to buckle down and get some while the getting is still good, and open. Yellowstone Park closes to fishing this year on November 4th. All of the perennial fall favorites are fishing well. It’s hard to put together a better day than a Madison / Firehole combo right now. However, warmer sunny days are ideal for a jaunt into the backcountry to explore the channel between Lewis and Shoshone lakes, or the lower Yellowstone Canyon near Gardiner. Brown trout throughout Yellowstone Country are activated and on the prowl. These last two weeks are a great time to explore any system in the park that holds these fish. Scenery, solitude, and selective trout can all be had on the Madison down in the valley these days. Pick a nice warm afternoon and explore the walk-wade stretch with a single dry fly. If you take your time and watch the slicks and gentle runs along the banks you can find sneaky fish rising subtly to Baetis and Midges. This is a slow paced game with plenty of time and opportunity to soak up the epic scenery in the valley right now. 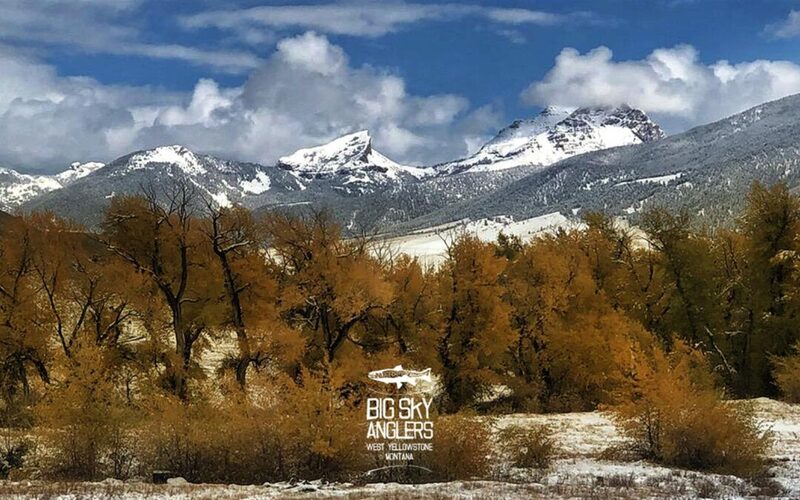 Amber fall light, snow-capped peaks and blue skies paint a jaw dropping backdrop to the fishing. BSA’s fall season on the MO is cranking on. The boys have scene it all this week from sunny with temps in the 60’s to cranking wind, snow, and temps in the 30’s. There’s been a variety of conditions, and a variety of sport to be had with the fly rod. We continue to chase those migratory browns with streamers, and hunt for heads up sipping fall hatches of Baetis and Caddis. There’s been some fun fishing, some beautiful fish, and some terrific clients. We’re excited to see what the next week brings with more comfortable conditions in the forecast. In keeping with the solitude and scenery theme, the Railroad Ranch will provide ample amounts of both. You’ll find some rising trout too. They’ll be technical as always, but we don’t head to the Ranch for easy fishing, especially at the end of October. Be prepared with small flies, long leaders, and the finest tippets you’ve thrown all season. Like a long distance runner training for a race, you’ve been honing your dry fly skills since the first spring hatches popped back in March. The time has come to see just how far your game has developed. World class rainbows will be eating Baetis and Midges. Do you have what it takes? There’s only one way to find out. The lower river continues to be a great option for any game you want to play. Streamers, nymphs, and dries are all productive. The ever snowier Tetons loom over this lower system serving as a not-so-subtle reminder of things to come. So, take advantage of these beautiful weather days while you can.